Some researchers believe that all ageing stems from free radical damage. The body is pretty fantastic at keeping us healthy, but it can only do so much. It requires help from us through food, nutrition, and the products we use. Environmental damage also leads to free radical damage. Free radicals can contribute toward a myriad of health issues, including arthritis, cancer, asthma, hemorrhoids, and depression. Even our food can cause free radical damage, and this occurs when we heat oils to a very high heat. What happens is that the free radicals that are created start to attack the cells of our DNA. Saturated fats have a lower risk of oxidation. Therefore, butter and coconut oil are extremely safe for cooking. However, polyunsaturated fats do not have the same fatty acid structure as a saturated fat. They are prone to rancidity and oxidation (peroxidation). Researchers have found that macular degeneration is linked to high intakes of polyunsaturated fats. Even monounsaturated fats can increase this risk. Coconut oil is a saturated fat. Saturated fats are a lot more protective against rancidity. Coconut oil is rich in antioxidants and reduces oxidation. One reason why food manufacturers add saturated fats to their foods is to reduce the risk of the food item going rancid. 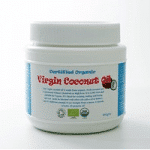 Coconut oil contains 92 percent saturated fat. Saturated fat lowers the risk of developing macular degeneration. Coconut products protect the body against cellular damage by pumping the body with protective antioxidants. Even using coconut oil on the skin can improve its look and texture. When studies were done on dry skin they found that this type of skin was low in saturated fat. Therefore, eating more good levels of saturated fats can reduce free radical damage both internally and externally. It is also excellent for removing pre-cancerous lesions on the skin when you apply the oil consistently. Saturated fats are not the ‘bad’ guy. There are both good and bad saturated fats. Contrary to popular belief, saturated fats are very protective because of their fatty acid structure. They are extremely safe to cook with, and have very little risk of oxidation, unlike polyunsaturated fats that are extremely prone to peroxidation and cause free radical damage. Free radicals are the cause of most of our health issues in society, including aging, depression, and arthritis. Consuming coconut oil reduces free radical damage, but other good coconut products include the meat, milk, and water.